Gill says of her work “I find inspiration for my work from natural forms and the ceramics of the east. I have always loved the purity of form and subtle glazes of ancient Chinese ceramics specialising in porcelain and stoneware clays. 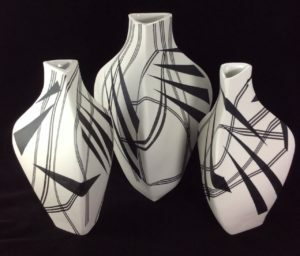 I enjoy all types of ceramic construction and consequently my work contains many different styles and techniques. Since retiring, three years ago, I have been able to concentrate on developing my own work. I built a studio in my garden at home and have been experimenting with a wide range of clays and construction techniques. Porcelain slab pots are my latest obsession!